Organic. The center of the sunflower gives the seeds which burst with Omega 3, and slow release energy to keep you centered all day. These little super seeds are sweet, nutty and packed with vitamins and essential fatty acids, they are the perfect snack and easy to add to many recipes and the spread makes eating them even easier and more versatile. Sunflower seeds are sweet, nutty and an excellent source of essential fatty acids, vitamins, and minerals. They are a delicious and satisfying snack and the spread can be used in sweet or savoury dishes. It come from one of the most beautiful flowers in the world, so let’s get some sunshine in your life! Sunflowers are tall beautiful plants with bright yellow flowers, that grow annually and harvest in Autumn when Sunflower fields turn bright yellow. They are native to Middle American region from where it spread as an important commercial crop all over the world by the European explorers. They are now grown across worldwide, with Europe, Russia, USA, and Argentina being the leading producers of sunflower crops. Sunflower flourishes well in well-drained moist, limey soil. The plant prefers good sunlight and forms a single large flower heads at the top. The sunflower head in consists of two types of flowers. The outside makes large, yellow petals, the central disk is made up of numerous tiny fertile flowers arranged in concentric whirls, which become the edible seeds. Delicious, nutty, and crunchy sunflower seeds are widely used as a healthy ingredient. They are high in protein like other nuts, Vitamin E, the B Vitamins especially folic acid, Zinc, Magnesium and Selenium. Their high concentration of folic acid makes them very useful for pregnant mums. The perfect yummy mummy snack! The seeds are also high in antioxidants and very rich in poly-unsaturated fatty acid linoleic acid, which constitute more 50% fatty acids in them. They are also good in mono-unsaturated oleic acid that helps lower LDL or "bad cholesterol" and increases HDL or "good-cholesterol" in the blood. 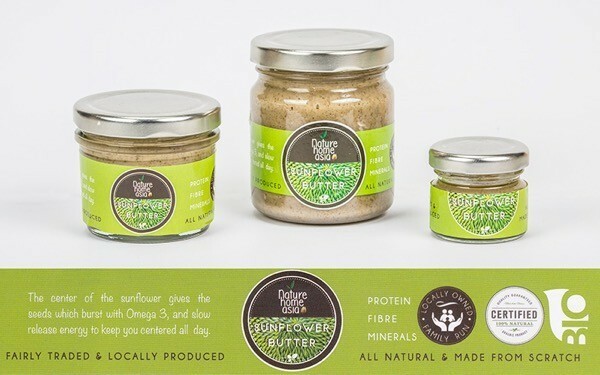 Sunflower Butter brings all the goodness of sunflower seeds in a delicious versatile spread. Eat alone, mix with nuts and seeds to make energy balls, spread in wraps with lots of raw veges and use as a dip. A powerhouse of nutrition and protein. Sunflower Power is the way to go!